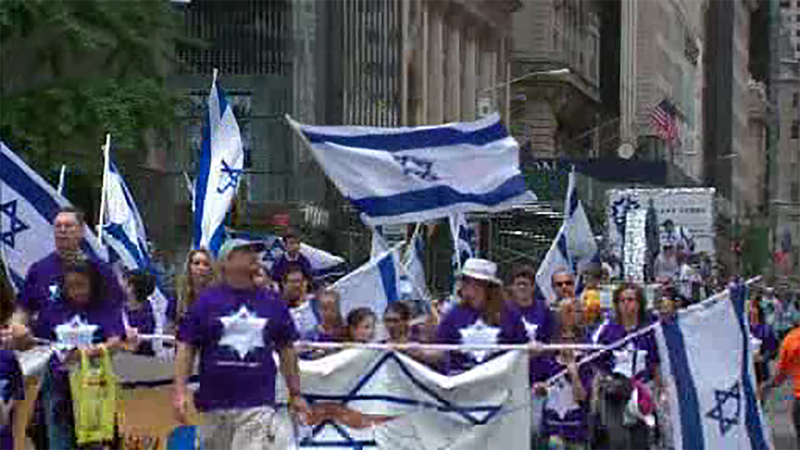 MIDTOWN, Manhattan (WABC) -- Elected officials joined thousands of marchers in a sea of blue and white flags along Fifth Avenue in Manhattan for the annual Celebrate Israel parade. Participants ranging from school-age children to adults came out Sunday under overcast skies for the event. Elected officials who marched included New York Gov. Andrew Cuomo and New York City Mayor Bill de Blasio, as well as Sen. Charles Schumer. Former New York Giants running back Tiki Barber was an honorary grand marshal, along with celebrity chef Jamie Geller, mixed martial arts fighter Haim Gozali, and Jerusalem Mayor Nir Barkat. The event was formerly known as the Salute to Israel Parade, and marks the birth of the Jewish state in 1948. The thousands of people who take part include students from regional yeshivas and Jewish day schools, Jewish groups and synagogues. 5th Avenue was shut down from 57th to 74th Streets to make way for musicians, dancers, floats and marching bands. 40,000 marchers from over 250 organizations participate in the march.